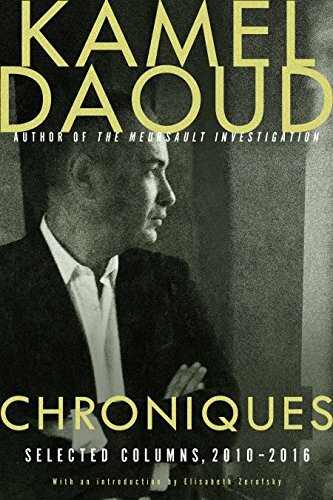 Algerian journalist and writer, Kamel Daoud, is a deep humanist and ardent, unrelenting cultural critic. His work explores his country’s struggles with colonialism, postcolonialism, and religious politics as they shape and constrain (or crush) the possibility of civil society, democratic politics, and the evolution of human potential. Chroniques is composed of 113 short, op-ed communiques spanning 2010–2016. 2011 was a particularly incendiary year for the region: (1) Tunisian street vendor, Mohamed Bouazizi, self-immolates setting Arab Spring in motion; (2) Egypt’s President Hosni Mubarak is ousted in the wake of massive protests in Cairo’s Tahrir Square; (3) violent uprisings roll across Syria and are met with equally violent repression from the Bashar Al-Assad regime; (4) Libyan dictator Muammar al-Qaddafi is deposed and killed; (5) Tunisia holds democratic elections in which an Islamist party wins a majority in the Assembly and must form a coalition government with non-Islamist parties; (6) the U.S. begins to draw down its troops in Iraq; and (7) Osama bin Laden is killed by U.S. Navy Seals. The opening section from 2010 is used to frame themes that will refract against the tectonic event of 2011 and their aftermath. Each communique plays like a dissonant note, sometimes coming in related, coherent clusters, but mostly as one pivot after another reflecting the turbulent unpredictability of the time. Stability is out, revolution is in, so are the Islamists, identity politics are a jumble, women and their bodies remain repressed, violence or its threat is endemic, corruption is all around, and there is an overall feeling of waves of humanity anesthetized by the complex trauma of colonial and post-colonial rule. Islamism sees the body as a source of shame according to Daoud, especially that of women. For women remind Islamist men that they, too, have a body and that body experiences desire interpreted as weakness. Indeed, the body and worldly experience only get in the way of eternity. This is a book of poetic language and deep insights into the political body and the body politics of North Africa and the Middle East. Any single chapter could be carefully parsed and deconstructed as the sole focus of analysis. But the power of Chroniques is the intertextuality of these pieces as they dance together over a seven-year span. If the book has any foible, it lies in its tendency to overgeneralize and perhaps too hastily conflate experience across the region. Morocco, for example, is not Saudi Arabia, though both are kingdoms and formal Islamic states. Yet in several instances, Morocco gets reduced to just another autocratic system. Morocco is singled out because it serves as an interesting counterpoint to socio-political trends in the larger region. It would be fascinating to read about Daoud’s deeper analysis of how that country does and does not resonate with its neighbors to the east. The post-colonial reign of Hassan II (1961–1999) is commonly referred to as the “Years of Lead” (i.e., equal opportunity repression). But his son and successor, Mohammed VI, appears to be taking a very different path: a new constitution; reasonable freedom of the press; military and police reforms; real political opposition, including secular and Islamic parties; greater human rights protections for women and children; formal recognition of the Amazighe (i.e., Berber) culture and language; and proposed judicial reforms. Concerning Arab Spring, it is possible to argue that it was Morocco’s Islamic parties with their legitimate religious voices that helped draw the religious conversation back to the center and away from the extreme margins. Not only did Morocco largely sidestep the Arab Spring, we also may be seeing the emergence of a more inclusive and pluralistic political system out of that process. Perhaps Daoud would see this as political theater without any substance. Likely he would underscore that all real power still rests with the king. Surely he would note that despite its openness and tolerance, it is still a police state. He would also undoubtedly remind us that the makhzen (inner circle) still holds enormous control. Yet Daoud’s discussion of political change is striking. He says: “It is also assumed that revolutions in our part of the world produce their fruit immediately: a fast-food vision of change, IKEA-style democracy.” Perhaps in his admirable embrace for democracy and individual liberty, he has overlooked a path moving forward with the potential to be a successful hybrid system of governance, albeit one different from his vision.